Most of us had childhood nicknames, most were unflattering and unwanted. I don't remember how, or when, it started, but by the time I was in Grade 7, it was pretty much established that my nickname was Pippi Longstocking, and I was rarely referred to by anything other than "Pippi" or "Pip" for the next two or three years. I'm sure it was partly inspired by my last name (Long) and the fact that I was in fact, very short at the time. I was also skinny, with glasses and buck teeth, and was miserably inept at every sport - all things that at the time guaranteed that I was to be teased and tormented during my entire public school career. One of the few photos from my childhood that doesn't make me cringe, and the only one where I am actually posing. Is that a hint of the inner Fashionista I'm seeing? 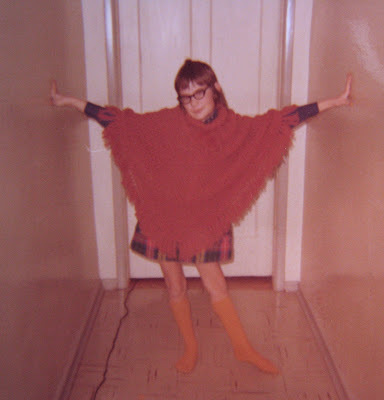 I was feeling pretty sassy in my mustard knee socks, plaid skirt and knit poncho - my mother and I had matching ones made although I don't remember us ever wearing them at the same time. 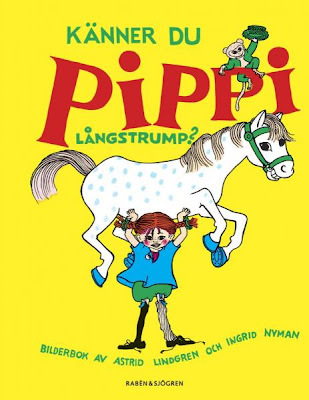 I was familiar with the fictional character of Pippi Longstocking, created by Swedish author Astrid Lindgren, from reading the books. As a child, all you want is to fit in and be accepted by your peers, and being tagged with the name of a character that I thought was the epitome of the homely, oddball, outsider was mortifying. Pippi's wardrobe was a rag-tag mix of cast-offs, and one of the most identifiable items were her mismatched stockings held up by garters on her skinny legs, as seen on this cover of the 2005 Puffin Modern Classics version of the first book in the Pippi series. So, fast-forward to almost 40 years later, and imagine my amazement at seeing these leggings on Etsy! I had found the link to the seller, Carouselink, from Desiree's blog a while back where she was showing off the funky corset-print t-shirt she had purchased from them. Now, I asked myself, why would I want to purchase an item of clothing that was tied to unhappy memories of childhood? Maybe because I had come to appreciate the qualities of the character of Pippi that I couldn't appreciate as a kid - her independence, rebellious nature, fierce loyalty to her friends, courage, and superhuman strength. She can lift her horse over her head! So, what's a girl to do, but embrace her inner Pippi? If I hadn't been so concerned with trying to fit in with the other kids, and be less me, and more them, I would have realized that Pippi Longstocking was a role model to embrace. She wouldn't have put up with the teasing and torment, and she would have stood up for other kids who had it worse than I did. 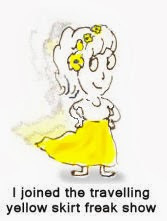 She encouraged kids to believe in themselves, and to be adventurous. She also had a sack of gold pieces, knew how to shoot a revolver, and had sailed the seven seas. Financially independent, skilled at self-defense and well-travelled - there are definitely worse role models. Aw, looook! Weren't you so awesome and dear!!! All of these photos of you are treasures, and how fabulous if we could all embrace our inner Pippi, or be so fortunate as to have such a strong vein of her in the first place. Your jacket is almost as deeply rad as your poncho of yore, and both sets of stockings (the mustard and the mis-matched) are beyond words. I love this post, your courageous reclamation. I wish I had read Pippi Longstocking as a child!! You were cool then and cool now!! You're wearing my favorite boots and those cuffs are uber fabulous. Now if I read the book I'll think of you!!! GREAT POST! what we all got teased for is what we value in ourselves NOW! This is so cool on so many levels Shelley! Firstly, I adore you in those mustard socks and spicey rust poncho. Both items would have been favorites back when I was about this very age. Same haircut too! I cried in the bathroom because I hated my real name! What a sad time. Good thing we have the ability to make up for it all now. You are looking so fantastically free from all the negative memories, that's for sure. Keep on doing what you're doing! You had style then, and you have style now! Pip, pip, hurray! fab idea and great work! Too funny, I was just telling hubby about Pippi yesterday as he had no idea what I meant when I commented on the striped Pippi Longstocking tights I was wearing! Yes, I'd say you were definitely showing signs of fashionista-dom as a kid - what a cute shot. I love those saucy tights and the outfit, Shelley - and those cuffs are really wonderful! HA!! You do look like Pippi. You are so much fun. Love it. Hell YEEEES! 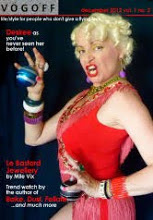 You look FABULARSE Shelley! I could not love these amazing tights any more - I'm off to see if they have them in my size! and I absolutely LOVED Pippy as a kid and I love her now... thanks for the reminder. I shall go find a copy and start reading it to my Annabel STAT! You had style then, and you have style now! Shelley, what a wonderful role model to embrace and your are doing so with panache. Every detail! Those fluffy cuffs are to live for and of course the leggings are perfection for your 'Pipi' self expression. I didn't grow up with this amazing personality in my life, but I can certainly appreciate her now through you. Oh I remember the Pippi Longstocking books, I think we had them read to us at school. My kids haven't read them, but you have inspired me to get them for my youngest daughter. If there is one message I want my kids to learn, it's your statement about not losing ourselves in our desire to fit in. Be you, not them - wise words, Shelley. The photo of you as a kid is just the cutest! I can see all your humour and sassiness and the style right there, in Little You! I saw those leggings too, I was really taken with Desiree's corset t-shirt and had a peek at that Etsy shop. 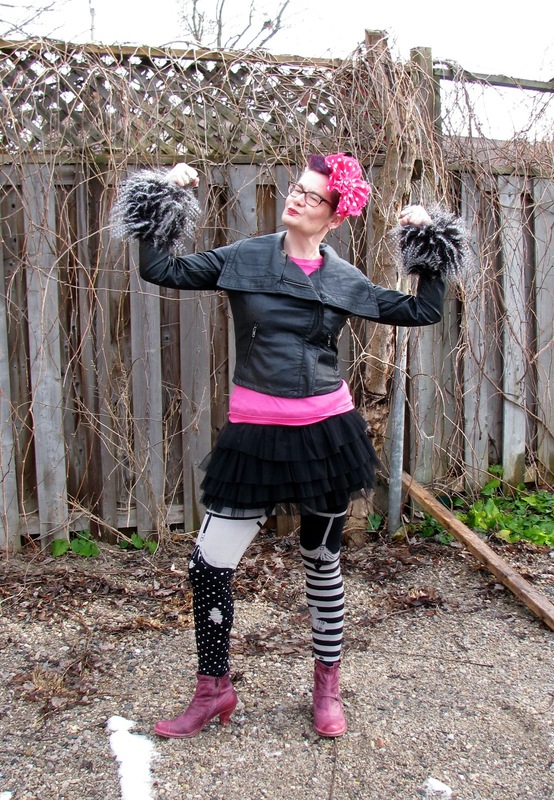 They look amazing with the pink boots, tutu, and fabulous jacket and fluffy cuffs! I waas one of those kids who got teased, too. We were so poor I had very few clothes, and they were awful. That's why I now sew up a storm and my sister owns a dress shop! I wish I'd had the Pippi books back then. All I had were the Bobbsey Twins (borrowed) and those Twins were rich! Shelley, you are awesomely precious! The pictures, past and present, are breathtaking. 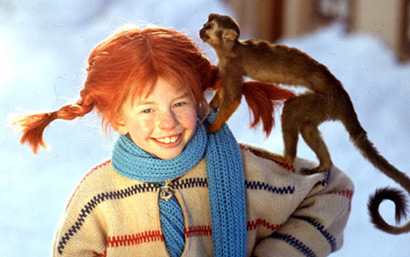 I remember how much I liked Pippi Longstockings tv series, I think she was one of my favorite characters when child and a great support to stay strong to my own personality when being marginalized! I would love to embrace once more my inner Pippi!! And you look gorgeous from your pink headpiece to your pretty booties, and love your leggings and tutu skirt, I would stole the whole outfit just now!! Beyond awesome Shelley! I remember trying to fit in as a kid and failing miserably- I always did like Pippi's look however, and those stockings are a fitting homage to one's unique childhood style. Pip, pip, hurray! How not to love you??? I got teased too big time! I was shy, nerdy, buck teeth and all so can imagine! I loved Pipi - I used to watch it in french, i never missed it! Keep being yourself don't change! the hell with everybody! seriously the best post ever from start to finish!!! You went to the wrong school. No one would have teased you at my public school. You'd have fit right in. You were truly a cute little girl. Just letting you know that I HAD to go buy those tights immediately. I also snagged one of their corset printed tees. I can't wait to get them! I need to release my inner Pippi. Yay! That is so awesome - I want to get another pair in a different print, and a corset t-shirt too. Can't wait to see a photo when you get them. How have I not seen your blog before now?? I came over due to the link from Megan at The Fashionable Bureaucrat - you are wonderful! I love your madcap style! And you're a fellow Canadian! So awesome! 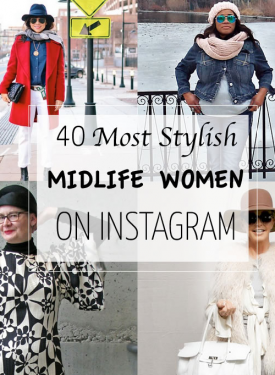 All my favourite bloggers have commented here too!